Does anyone else find it difficult to convince your spouse of a major life change? When I first decided to take the leap and quit my full-time job to dedicate more of my time to my online business, not only was I nervous and scared, it took a lot of convincing to get my husband on board. I was going to be giving up great health insurance, decent-ish pay, and stability. It took me quite a while from the time I first brought up the idea to my husband before I actually put in my notice simply because we were both scared. I needed to convince my spouse starting a small business online was the right way to go — and that we could make it work. When I first brought this up to my husband, I made a few mistakes to start out with that I’m hoping I can help you avoid. Initially, I had the attitude that I’m going to make this work and he should just get on board regardless, even if he didn’t really understand what it was I was going to be doing and how this would contribute to the household finances. Regardless, I continued to act as if he “knew” what it was I was doing and what my plan was. I felt he should have been “more supportive” of me and my business. I would even get angry every time he would bring something up about money. Starting an online business from scratch is hard enough, there’s no reason to complicate it more by leaving communication by the wayside! One of the biggest lessons I’ve learned since starting my business is that life and work are not always separate. There will be days when I sneak in 15-20 minutes of work in between laundry, feeding the kids, cleaning the house, and going for walks. Then there are days when I can dedicate my entire day to getting work done, but that also means everything around the house is left to the wayside. You have to decide on a balance that works for you and your family. When you’re running a one-woman show, everything you do impacts your family. Believe it or not, when I quit my corporate job I had no written plan. I had a plan “in my head” and that didn’t make my husband all warm and fuzzy inside, but I never really sat down and wrote down an actionable business plan. Here’s the truth: Even though I was super confident that I’d make this work, it was scary to write it down and see my big goals all right there in front of me. Really scary! What if I didn’t know what I was going (I didn’t)? What if it failed (some things did flop)? What if no one read my stuff? All of these were legitimate fears that were just holding me back, and keeping me from sitting down and writing out a plan. A plan that would have helped put my husband’s mind at ease about our financial situation. Luckily, I found a way to plan for my business that encompasses both life and work and it’s super fun! I now have a working calendar that we can both see. It tells when I’m in “mom-mode” and when I’m in ‘business-mode.” It works for us because there is a plan. There is no guessing as to what is going on and who is doing what at any given time. I suggest making a plan of your own if you are worried about quitting a full-time job to start your own business, as I was, or if your spouse is having doubts and you want to make sure you are both on the same page before you take the leap. It may be tempting to throw caution to the wind and just run with it, but when it comes to your finances you don’t want to mess around. Talking about money can be stressful, I get it, but when it impacts your life and livelihood, it is important to have the conversation with your spouse. If you ignore finances at the beginning of your business, I can almost guarantee that money will be a huge source of tension in your household. Education Expenses — Do you need additional training to start to grow your business? Your Time – What is your time worth to you and your family? This is not an exhaustive list of everything you’ll need, and each business will require their own “materials”, but it’s a good place to start and to get thinking about what you are going to need to expense. I highly encourage you to sit down with your spouse and map out your family and business budgets so you are on the same page. I also recommend keeping your personal and business money separate so it is easier to track and protect your personal interests. Starting a business from scratch is a lot of work. There is no way to sugar coat it. When you are just starting out you will invest a lot of time getting your business off the ground, but it can be a lot of fun and totally worth it in the end! When you are working on something that you’re truly passionate about, it’s easy for you to let it take over. It was hard for me to continue working my full-time job while I was building the foundations of my business because all I wanted to do was work on growing and getting better. Caution: Running a business is a lot of work and it will quickly take over your life, including your family if you let it. I had to purposely set restrictions for myself on how much I was working because I would get into the bad habit of working into the night, working weekends, and basically working myself to death–leaving little time for family stuff. Once I decided I was not going to work on weekends, and dedicate evenings to family time, everything in our household ran a bit smoother and everyone was less stressed–including me! Join my FREE Facebook Group, Rock Your Craft Business, to jump in and ask questions about time management. Also, don’t forget to work in a little “spouse time” now and then. Date nights are a great way to reconnect after you’ve been dedicating so much time to grow your business! Even something as simple as having breakfast together can go a long way to keeping your relationship intact. As moms, we want to think we can do it all. Personally, I thought I’d be able to work at home full time and be a full time at home mom without any outside help. While my intentions were good, I quickly realized that I couldn’t fully dedicate myself to my work if I had kids interrupting me every two minutes, and I couldn’t dedicate myself fully to being a great mom if I was always sneaking away to get in a little work. Whether you currently have childcare because you work full-time or you stay home with your kids now, if you plan on working on your business full-time you cannot underestimate the need for childcare. While there are many moms out there who can work and grow without regular childcare, there are just as many moms who can’t get anything done while their kids are at home with them. I don’t work well when my kids are here with me. It is part of my personality and I get stressed out when I get interrupted, or I get stressed out if I don’t feel like I’m spending enough time with my kids. It’s almost a lose-lose situation if I try to do everything myself. This is where that scheduling comes back into play. If you have dedicated work time and dedicated family time, your life becomes so much easier and you take some unnecessarily high expectations off your shoulders. Don’t forget to join my FREE Facebook Group, Rock Your Craft Business, and join other likeminded entrepreneurs like yourself! Are you ready to take your business to the next step but aren’t sure where to start? Need some marketing advice? Having growing pains? 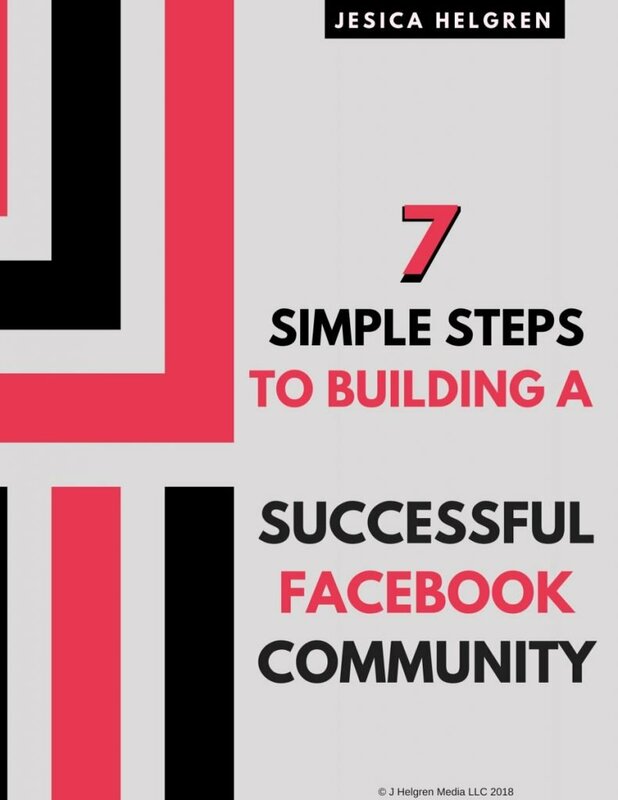 Check out my Free Download, 7 Simple Steps To Building A Succesful Facebook Community, and get started on building a community of customers/clients who WANT to purchase from you!